Sandra Christie trained as a jeweller in her early career and also developed an in- depth knowledge and extensive experience with textiles. 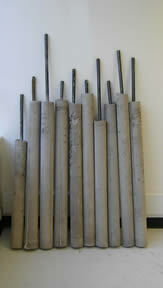 More recently the focus has been on harder and more industrial materials, experimenting with wood, concrete and metal. 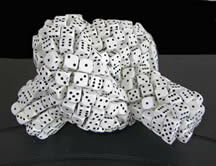 Evidence of the hand made is often visible, striving for an empathy between materials and form. Shape and texture continue to be an important focus and later work combines soft, organic curves and folds with hard materials. This is a found piece of Ash wood which was drilled through the length with two formations of holes. Sticks of willow were threaded through the holes, with a higher density on the lower row. The heavy Ash was supported by the collective strength of the willow sticks. 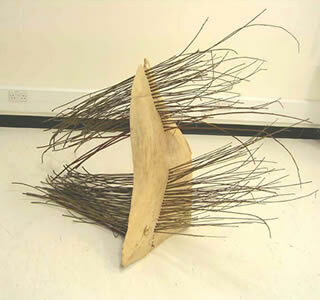 This work emerged in 2008 with a site specific sculpture for a woodland area. Approximately two metres high and three metres breadth, and simply called Organism, the aim was to create something that was subtle and sympathetic to the landscape. The copper Minimalist form weathered to a dark nut colour, invisible until the viewer is within a few feet of the structure. 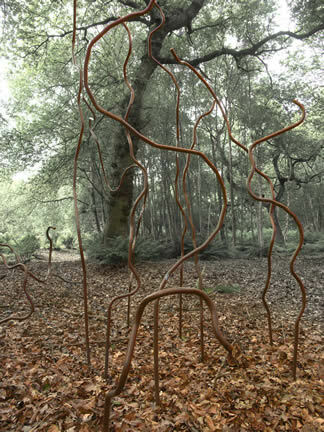 Planted directly into the woodland floor it blends in to the surrounding nature and mimics the trees by swaying slightly in the wind. Close inspection reveals the inorganic metal, whilst still hinting at its origins in the earth. 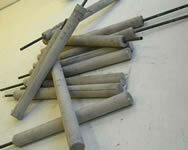 These cast concrete pillars each hold a steel tube, which was inserted at the time of casting. (Left) The completed work can be read as a collection of the same pillar repeated, but each with its own characteristic. This version is ordered and gives a static image. (Middle) Here, the pillars were slotted into a sectioned box and viewed from above. The differences and similarities are much clearer and the spaces in and around each pillar become more important. (Right) The third view is a random placement of the pillars where the weight and instability are more obvious. 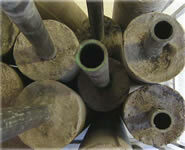 Each pillar is affected by the others and sliding and rolling could easily occur.